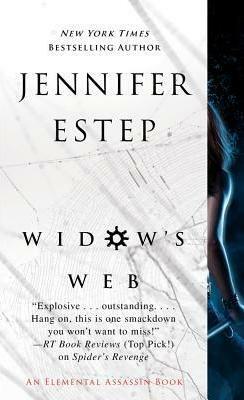 The seventh book in the hugely popular Elemental Assassin series by New York Times and USA TODAY bestselling author Jennifer Estep--Gin Blanco is back and ready for action. I used to murder people for money, but lately it's become more of a survival technique. Once an assassin, always an assassin. So much for being plain old Gin Blanco. With every lowlife in Ashland gunning for me, I don't need another problem, but a new one has come to town anyway. Salina might seem like a sweet Southern belle, but she's really a dangerous enemy whose water elemental magic can go head-to-head with my own Ice and Stone power. Salina also has an intimate history with my lover, Owen Grayson, and now that she's back, she thinks he's hers for the taking. Salina's playing a mysterious game that involves a shady local casino owner with a surprising connection to Owen. But they call me the Spider for a reason. I'm going to untangle her deadly scheme, even if it leaves my love affair hanging by a thread. Jennifer Estep is a New York Times and USA TODAY bestselling author, prowling the streets of her imagination in search of her next fantasy idea. Spider's Bite, Web of Lies, Venom, Tangled Threads, and Spider's Revenge are the other books in her red-hot Elemental Assassin urban fantasy series. Jennifer also writes the Mythos Academy young adult urban fantasy series, and she is the author of the Bigtime paranormal romance series. For more on Jennifer and her books, visit her website at JenniferEstep.com and @Jennifer_Estep.